Growing up in an Italian American family in New Jersey, the granddaughter of immigrants, I was well acquainted with a vegetable garden and fruit trees. My maternal grandfather, being a man of few words, had a somewhat intimidating aura about him; being a child I never considered that it was possibly because his English language skills were somewhat limited. In an attempt to replicate what he left behind in Calabria, he planted the fruits and vegetables of his childhood, including a fig tree. Now, there is nothing unusual about that is there? Certainly not, however the eerie part of his fig cultivation ritual included an annual late fall removal of the fig tree from the ground, followed by an earthen burial to protect this native Mediterranean species from the harsh New Jersey winters. Somehow, looking out of my bedroom window during the bleak days of winter and gazing at the fig burial site, I felt a bit uneasy. 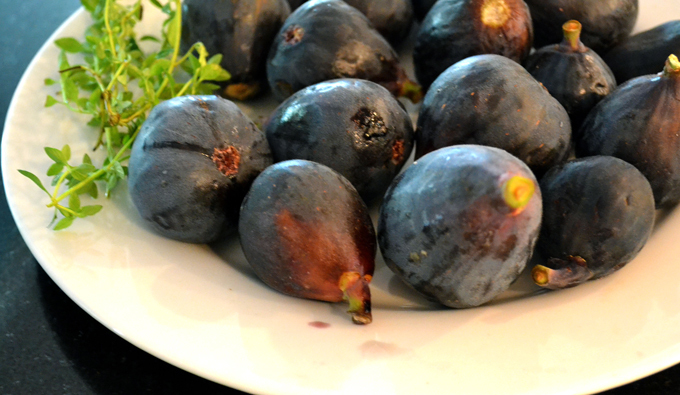 Figs were a part of our life then as they are now. This recipe is combines the essence of those memories, with a delicate yet fool proof and versatile crust. The pistachio flour adds a nice twist, which hearkens the flavors of the Mediterranean. Place the flour and salt in the work bowl of a food processor and pulse lightly until combined. Add the cubed butter and grated lemon peel and pulse until the mixture resembles pea sized crumbs; you do not want to over process the mixture. Add a bit less than ⅓ cup of the ice water with the processor running; if the dough seems terribly dry add a little more water one tablespoon at a time. Once the dough begins to come together, remove to a work surface and gather by hand to form a disc. Cover well in plastic wrap and refridgerate overnight. This dough can be frozen for several weeks and placed in the refridgerator the day prior to using. Combine the pistachio, flour, and sugar in the work bowl of a food processor and process until it is a flour like substance, set aside. Preheat your oven to 400º. Line a heavy duty baking sheet with either parchment paper or a Silpat. Remove the rested dough from the refrigerator about 10 minutes prior to rolling. Lightly flour a piece of parchment paper and roll the disc of dough into approximately a 12 inch imperfect circle. When rolling, work from the center outwards, always moving the dough as you continue. Slide the dough onto the prepared baking sheet. Cover the center 8 or 9 inches of the pastry with about one half of the pistachio mixture, this will act as a base to catch any juices that may result from the figs and prevent the crust from becoming soggy. Use your judgement as to how much of the pistachio mixture is needed, the more juicy the figs, the heavier the layer of pistachio mixture needed; any remaining pistachio mixture may be stored in the freezer for another time. Arrange the prepared figs over the pistachio mixture, starting at the center and working your way to the perimeter, using the pistachio mixture as your guide. Drizzle the figs with the honey, followed by small segments of the thyme sprigs. 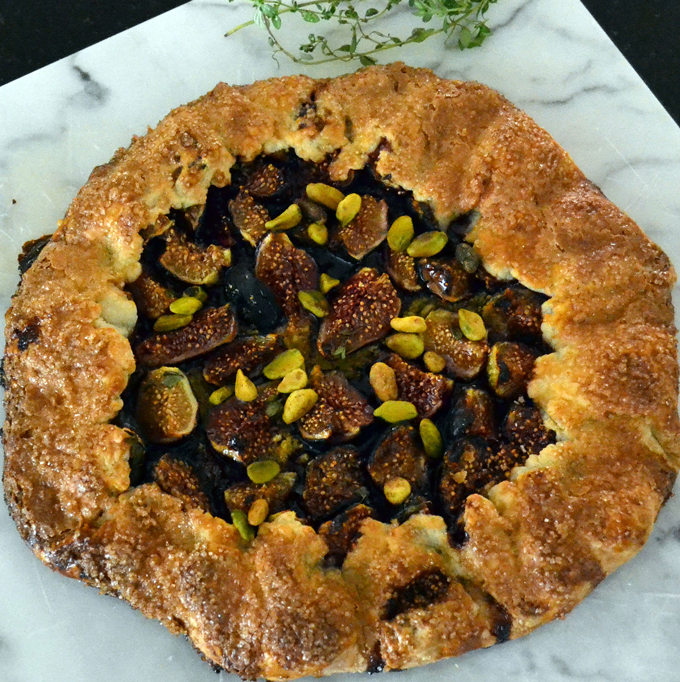 Begin to carefully fold up the uncovered portion of the pastry in approximately 3 inch segments, over the figs to form a crust edge. Proceed until you have finished;the crust should look rustic, yet be substantial. Brush the pastry edge of the crostata with the beaten egg and dust with the turbinado sugar. Place into the preheated oven, close the door & put on the light: refrain from opening your oven. Check the crostata periodically through the oven window. It is ready once the crust is a deep golden and the fruit is bubbling. Remove and allow to cool at room temperature. The crostata is best served warm or at rooms temperature. Garnish with a few whole pistachio nuts and some fresh thyme sprigs. Olive oil gelato is a perfect accompaniment for Crostata di Fichi, however it stand alone quite nicely.